Does your website welcome mobile visitors? Relaxing on the sofa looking for local companies or strolling around town flicking through the internet. How often do you find yourself looking at websites on your phone or tablet? It's essential for your website to be mobile friendly. A negative experience online can make or break a sale. Mobile users don't want to be put off by a website by having to pinch or scroll the screen across to read it and you don't want to have one of those annoying sites, so it's important to ensure your website is mobile friendly. 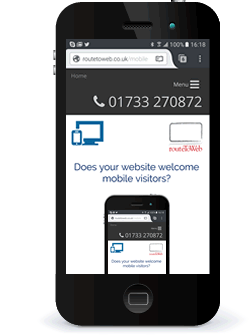 Over 50% of internet access is now via a mobile device, yet many websites are still not mobile friendly and if you are unsure where your website sits, check it out on Google's mobile-friendly test page and if it fails or doesn't quite get the full marks, contact routeToWeb and let us explain how we can help you mobilise your site. Have a competitive advantage over your competition. Phone us on 01733 270872 to discuss.